3 2 B Free is dedicated to providing a pathway to financial security for our members by employing a generous marketing matrix that is unlike any compensation plan you’ve ever seen before. It’s an incredibly simple approach: you get 3 who get 3 who get 3 and that’s it! There’s no endless recruiting and nothing to buy and buy and buy. Our unique alternating payment and qualifying levels ensures that no one has the advantage of starting at the top and no one gets stuck at the bottom. Everyone has exactly the same opportunity. There aren’t any “fat cats” because there aren’t any “little guys”. Every level is a payout level for someone in the network. The money that can be received by members of the 3 2 B Free network is substantial because of the employment of cutting edge software and systems that practically eliminate the need for the traditional role of hands-on management. The savings generated by automating the management and money-making process enables us to return fully 83% of the profits generated right back to the members. The simplest way to understand this opportunity is that it’s crowdfunding without sharing intensely personal information that’s an inherent part of crowd funding platforms. The “crowd” we’re funding is you, our members. 3 2 B Free is unlike anything you’ve ever seen or been a part of ever before. Get the details of the 3 2 B Free experience by watching the video presentation on our Home page and exploring our YouTube Channel (32BFree Members) and Facebook (www.facebook.com/32BFreeMembers) and Twitter (www.twitter.com/32BFreeMembers) pages. There is certain trade secret and propreity information we can’t include without sacrificing our unique marketing position and approach; nonetheless, if there’s anything you don’t understand, we want to make certain your questions are answered, because obviously, the more familiar you are with all aspects of 3 2 B Free, the more comfortable you’ll be in sharing this incredible opportunity with others. And the more you share, the sooner you’ll be generating a lot of money. There’s a lot of information, but it’s easily understood. As we begin this detailed explanation, we want you to know that the math is pure and the numbers are both real and attainable. There are five payment levels in the matrix, three qualifying levels that alternate betwen payment levels, and the final three qualifying levels that generate a total payout in excess of $4,000,000.00. As the numbers of people in your network increase dramatically, keep in mind that you only need three. That process of three sharing with three who join is all you need to succeed. The numbers can fill in very quickly because the growth can come so fast. And with very little work and virtually no “recruiting” – the growth within your network results from the three people you introduced to 3 2 B Free who decided to become members. It only takes 3 to be free! 1. You become a member of 3 2 B Free and network with three people who become members. That group of three who joined and are part of your network and represent your first Payment Level – entitling you to a total reinbursement of your $50.00 membership – so at that point, there’s no risk! You have a total of 3 people in your network. 2. The three people you introduced to 3 2 B Free and became members network with three who become members for a total of nine members (3X3=9) in your network represents a Qualifying Level. No monies are received by you, but are received by other members of the network. 3. Those three each network with three other people who become members. That group of twenty-seven people (3X9=27) represent Payment Level (2) in your network. You receive total payments of $675.00. 3. Those twenty-seven people each network with three people who become members. That group of eighty-one (3X27=81) represents a Qualifying Level in your network. No monies are received by you, but are received by other members of the network. 4. Those eighty-one people each network with three people who become members. That group of two hundred forty-three (3X81=243) represent Payment Level (3) in your network. You receive total payments of $6,075.00. 5. Those two hundred forty-three people each network with three people who become members. That group of seven hundred twenty-nine (3X243=729) represents a Qualifying Level in your network. No monies are received by you, but are received by other members of the network. 6. Those seven hundred twenty-nine people each network with three people who become members. That group of two thousand one hundred eighty-seven (3X729=2,187) represents Payment Level (4) in your network. You receive total payments of $54,675.00. 7. Those two thousand one hundred eighty-seven people each network with three people who become members. That group of six thousand five hundred sixty-one (3X2,187=6,561) represents Qualifying Level 1 of 3 for Payment Level 5 in your network. No monies are received by you, but are received by other members of the network. 8. Those six thousand five hundred sixty-one people each network with three people who become members. That group of nineteen thousand six hundred eighty-three (3X6,561=19,683) represents Qualifying Level 2 of 3 for Payment Level 5 in your network. No monies are received by you, but are received by other members of the network. 9. Those nineteen thousand six hundred eighty-three people each network with three people who become members. That group of fifty nine thousand forty-nine (3X19,683=59,049) represents Qualifying Level 3 of 3 for Payment Level 5 in your network. No monies are received by you, but are received by other members of the network. 10. Those fifty nine thousand forty-nine people each network with three people who become members. That group of one hundred seventy seven thousand one hundred forty seven (3X59,049=177,147) represents Payment Level 5 in your network. You receive payments totaling $4,428,675. If you find yourself looking at this and thinking, “It’s too good to be true”, we understand your skepticism, but please don’t let it hold you back from the future you deserve. 3 2 B Free is much more than a one-time big-time payday. 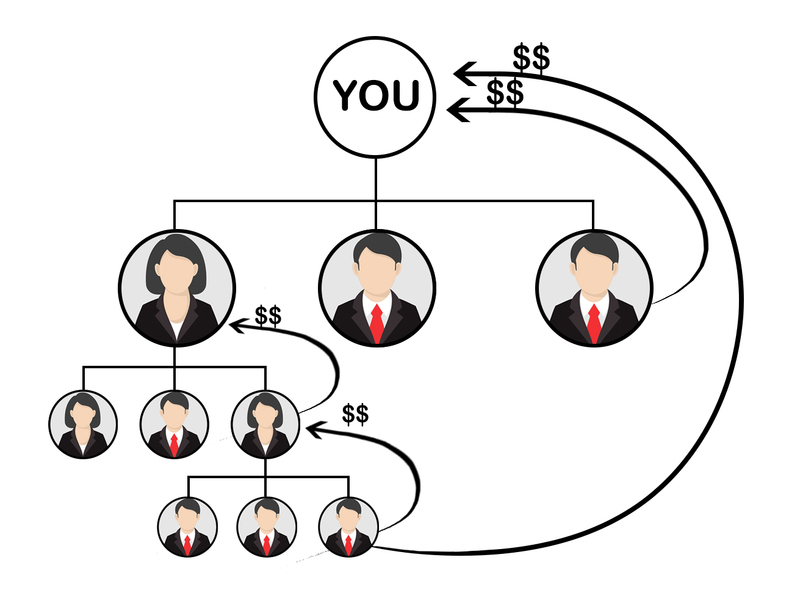 You can re-enter the matrix by purchasing an additional membership at any time – you could actually have multiple networks growing simultaneously, which can begin generating residual income. The network you grow can travel with you to additional opportunities or simply roll-over a new membership in 3 2 B Free to experience its incredible growth again and again. This success-based approach completely eliminates the usual “achilles heel” of these type of endeavors, because the success people experience fuels our continued growth – it’s not about “running out of people” (a virtual impossibility, but a consistent point of criticism leveled against network marketing efforts); it’s about providing greater opportunities for success to those who have attained success – and wouldn’t you like to be part of that? We’ve gone into great and revealing details no other company has ever shared to the degree that we have so you can verify the accuracy of our approach. We’ve spent years perfecting this. All you need to do is become a member and share your 3 2 B Free experience – just like you’d share a movie you enjoyed or a new restaurant you’d discovered. 3 who get 3 who get 3 who keep repeating the process is all you need for life-long financial security.